Most of us love carbs—pasta, bread, grains, all those good things—but often, carbs just don’t love us back. A low-carb diet can actually be a good way to keep your health in check (blood glucose and insulin levels decrease, which minimizes fat storage in your body), but what about trying to follow a low-carb vegetarian diet? It’s a bit more of a challenge, but it’s definitely doable with some easy tricks (more on that in a bit). First of all, carbohydrates are a macronutrient food group that is used for energy in the body. Don’t forget that our body needs carbs to carry out its processes, but when we consume too many carbs, the body starts to store fat. “The good news is that a low-carb diet does not involve calorie-counting, a method which tends to make people feel deprived,” says Juliana Shalek, MS, RD, CDN, and founder of The Nutrition Suite LLC. “On a low-carb diet, you can still fill up on protein and healthy fats, which can be very satisfying,” Shalek explains, adding that you can still have carbs that are high in fiber with a lower glycemic index—like oatmeal, beans, and whole-grain bread—since they have less of a significant impact on our glucose levels. Now, if you are following a low-carb vegetarian diet, Shalek says you should continuously monitor your protein levels since you won’t be getting certain nutrients from meat. But other than that, you’re good to go. One thing Shalek says she’s strict about with her clients—including vegetarians—is not completely eliminating carbs from their diet. “Carbs serve an important role in our body, and if we completely cut them out, we are more likely to overeat them later,” Shalek explains. “So I urge mindfulness: choosing whole grains instead of refined carbohydrates, watching portion sizes, and trying to spread out servings of carbohydrates evenly and consistently over the course of the day to promote better blood glucose control.” Now, in case you’re wondering which foods you should be consuming more of on a low-carb vegetarian diet, we asked Shalek to share her 15 favorites below, plus one day’s worth of go-to meals that incorporate them. This nut is a good choice because it’s high in protein, fiber, and heart-healthy fat. Furthermore, Shalek says they are a great snack on the go (just try to choose unsalted). “It’s important to be mindful of serving size since they are high in fat,” she says. Chia seeds can be used as a high-protein and high-fiber topping in your salads, smoothies, yogurt, and cottage cheese. “Plus, they’re high in omega-3 fatty acids, which help reduce inflammation in the body and lower your risk of cardiovascular disease,” explains Shalek. Worth noting: They contain about five grams of fiber per tablespoon, so technically your net carbs are low per serving. Other than being rich in protein and calcium, nonfat Greek yogurt also contains probiotics to aid in digestive health. “It’s so versatile—you can add to fresh fruit or low-fat granola or use it as a lower-fat substitute for mayonnaise or sour cream in certain dishes,” explains Shalek. “Non-starchy vegetables such as kale and spinach are what I like to call ‘good bang for your buck’ foods,” says Shalek. “This means you can fill up on them without taking in an abundance of calories, and they’re high in fiber so they keep you full between meals.” Additionally, these veggies contain important vitamins like C, A, and K, plus iron. This tasty vegetable contains a variety of vitamins and minerals like folate, potassium, and vitamins C and K (plus, a lot of fiber). Use it in place of meat for your main since it’s plenty filling. Eggs are great for a low-carb vegetarian diet because they are protein-rich and contain healthy fats (and keep you full longer due to their high protein). Bonus points that they’re easy to prepare and you can avoid monotony by cooking them different ways, says Shalek. “You can remove the yolk if you’re watching cholesterol levels,” she says. “Tofu is a great source of protein for non–meat eaters, and it’s so versatile that it can be used in various dishes,” says Shalek. It’s low in calories and fat and high in iron and calcium. Berries are high in fiber, antioxidants, vitamin C, and folate, which all have a beneficial impact on your body. “Do be mindful of appropriate portion sizes because they contain sugar—although they are also high in fiber to prevent significant sugar spikes and to keep you full longer,” says Shalek. “You can add fruit and nuts or blend in a smoothie for added protein for breakfast or a snack,” says Shalek. In case you didn’t know, cottage cheese is an excellent source of protein, calcium, and vitamin B12 (just opt for a low-fat version if possible). If you’re into avocados, here’s the good news: They contain healthy fats that are high in monounsaturated fatty acids and important nutrients including folate, vitamins C and K, and potassium. They’re high in fiber, keep you full, and help regulate blood glucose levels. “Eat them on their own, as a spread, or as a dip,” suggests Shalek. A little goes a long way with this treat: Spread it on an apple, a piece of celery, a whole-grain cracker, or eat it on its own. “It’s a very satisfying snack to keep you full between meals since it’s so high in protein,” says Shalek. Looking for recipes that work for a low-carb vegetarian diet? 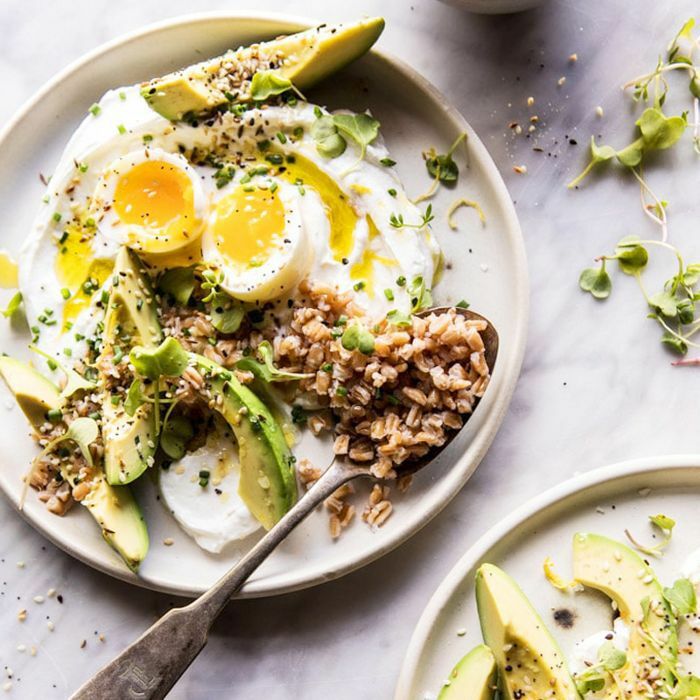 Whip up an egg avocado yogurt bowl, some Moroccan stuffed eggplant, or goat cheese scrambled eggs.